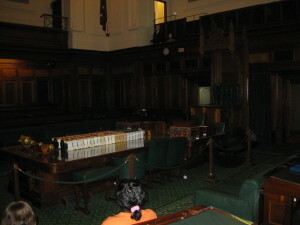 Before the New Parliament House there was the Old Parliament House. Designed by John Smith Murdoch, the Old Parliament House is an example of the “stripped” Classical style of architecture – symmetrical and balanced but without flourishes like pillars and pediments – which was commonly used for government buildings in Canberra during the 1920s and 1930s. It began operation on 9 May 1927, as a temporary base for the Commonwealth Parliament after its relocation from Melbourne to the new capital. It served for sixty one years, until finally, in 1988, the New Parliament House was opened. These days Old Parliament House is home to the Museum of Australian Democracy – one of the country’s most fascinating museums. The building itself is a monument to its era, with frosted glass panes in doors, wooden signs with gold lettering ghosted in green and pointing gloved hands, of dark, narrow wood-panelled corridors and the faint, but unmistakable, scent of a time when smoking indoors was perfectly fine. Clichés like “if only these walls could talk” spring readily to mind. Our group was greeted at the front door by a guide and taken to a spacious ground floor room, once probably some kind of common room or café but now a bright, light-filled classroom. The thirty students were divided into groups and each was given a coloured box. Inside each box were descriptions of the roles they were to play in an enactment of the landmark debate on the Franklin Dam issue. There were rudimentary costumes, scripts and artefacts like letters, newspaper articles and banners. Once hydro workers, protesters, representatives from the tourist industry, police and politicians were “in character” it was off to the House of Representatives to debate the issue. The rest as they say is history!